I would LOVE to have all of you follow me as I journey over to my new blog. You can find Healthful Bites here. Hope to see you all there and thank you for following me along during my experience in NYC! Skyline from the Staten Island Ferry. Great shows with fabulous friends! and statue sights from the crown with the family! It was an unforgettable, amazing summer that I will look back fondly upon. I really appreciate all of you for following along with me! My new blog will be launching in the next couple of weeks and I hope you will join me there as well. Here’s the plan: post three times each week…Day one: fitness DVD review, gym workout plan to try, new fitness finds, etc. Day two: health news review–post a link to a new health-related news article and discuss (hopefully we can make it a conversation!). Day three: restaurant, meal or new nutritious food review. How does that sound to you? I want to make the blog something that you will enjoy reading so please leave a comment with feedback that I will use when developing my new blog in the next few days. Thank you! Lastly, here are a few reviews of decent dessert, lunch and dinner places. 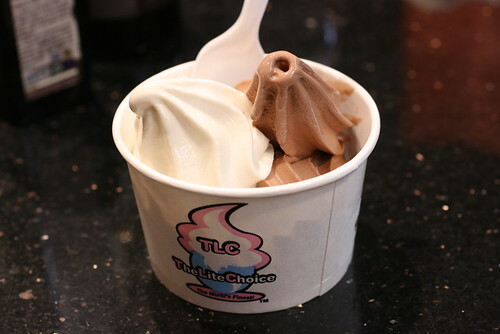 Pros: All-natural, low fat, low calorie (all flavors 80-120 calories) soft serve, slightly lower prices than many frozen yogurt chains in NYC: basically like Tasti D-Lite at a lower cost, student discounts, large variety of flavors–lemon meringue, marble cheesecake or peanut butter jelly anyone? Cons: Few, if any, fresh fruit toppings, advertise Internet access–although this is only available for a fee at many locations, full nutritional information only available for chocolate and vanilla (only calories offered for other flavors). Thanks for the photo Food Mayhem! 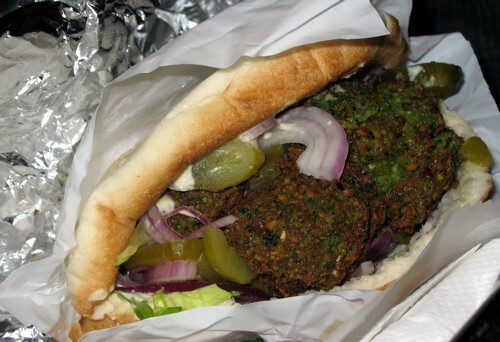 Pros: Delicious, soft whole wheat pitas, multiple meat/vegetarian pitas fillers, free fountain drink refills, company focuses on high quality ingredients without unnecessary added fats (yay for non-fried falafel! ), meal choice of pita, salad, platter or hummus plate, different flavors of hummus available. Cons: Small falafel, higher prices for white meat chicken (which is my choice over dark), vegetable topping choices are limited so that you pay for any over a certain amount, only lentil soup offered even though the menu said there would also be a soup of the day. Photo courtesy of Fine China. Hint: Enter “CHICKPEA” at checkout for your order on the Web site to receive $5 off of your first order! Pros: Tasty tart yogurt, WIDE variety of nutritious topping options, quite a few locations across New York and California, delivery available, fun Web site! Cons: Prices can get high since you pay for additional toppings over 1-3 depending on size ordered, often crowded, not a good option if you prefer sweet yogurt. Photo by Johnny Lopez from Pinkberry Groupies Gallery. Cons: Pancakes seemed a bit greasy during my brunch visit, prices are just OK, crowded dining room with few tables, service was a bit slow, I only visited once so I didn’t get a chance to review more dishes! Photo courtesy of Healthing It‘s trip to Curly’s. Pros: Convenient location to my workplace and many locations around Manhattan, large variety of menu offerings (quesadillas, salads, pasta, sandwiches, pastries, fruits, coffee drinks, soups, quiche), no chemical additives or preservatives in products, great community involvement. Cons: Prices are high, customer service leaves room for improvement, design-your-own sandwiches aren’t offered so I can’t custom make my own weird sauce-free sandwich, some locations aren’t open for dinner. Create-your-own pasta at Cafe Metro. Pros: Low prices, HUGE menu, Asian and non-Asian meals available for varying diner adventure levels, full bar. Cons: Menu descriptions could be more clear–I ordered a battered soy patty by mistake thinking it was a soy burger, more outdoor seating would be great, service could be improved. Next up: I’ll post a few pictures to wrap-up and explain the exciting new direction my blogging will take! Cons: Crowded dining area, only options are bottled/canned drinks (or lukewarm water), pizza is cooked and displayed in a case, then reheated–this doesn’t always work well because the crust gets tough. Pros: Student discount with ID, delicious “nature” (AKA veggie) burger, large menu with many combination options, sandwiches served in whole wheat pitas, convenient for a stroll at the beautiful Washington Square Park after dinner! Cons: Autographed bodybuilder photos on the wall are a bit creepy, can get pricey, the pizza I ordered once had a soggy bottom–may want to stick with the sandwiches. Pros: Menu full of fresh, healthy sandwiches, soups and salads, delicious wood oven baked bread (and free samples are available), can opt for carrots instead of chips as a side option, relaxed coffee shop atmosphere with Wi-Fi, nutrition information listed on menus and menu boards, free drink refills. Cons: This chain restaurant has no branches in Iowa (if I want some back at home, the closest locations are in Illinois and Minnesota), can get expensive, almost every time I went to the location in Union Square this summer one of the two restrooms was “Out of Order,” large crowds may slow service. My good friend Jenn, also a Cosi fan, is lucky enough to have a restaurant location nearby. Learn more about her delicious meal here! Pros: One location VERY convenient to where I worked, delicious baked sweet potato fries, many different lean meat options (bison, ground turkey breast, and for the adventurous, ostrich), I hear the smoothies are good, but I didn’t try one, nutritious breakfast, lunch, dinner and dessert options, large menu of healthy foods, but also a “cheat day” menu for those who want to splurge! Cons: Service can be lackluster (during one of my two visits, the employee ringing up my order was on her phone WHILE I was ordering), prices are a bit high, large amount of promotion for low-carb menu items–didn’t they get the memo that a moderate amount of healthy carbs are necessary and good for you? Pros: Menu contains no additives or preservatives, around-the-clock healthy options including whole wheat belgian waffles with fresh fruit, whole wheat wraps, veggie-filled ravioli and yogurt parfaits, most menu items are baked not fried. Cons: The turkey meatloaf I was served–the first meatloaf I’ve ever eaten–was room temperature. I don’t know if it was supposed to be like that, but I preferred it after I asked them to reheat it. Prices are a bit high (order a platter for the best deal), “almost rice:” steamed vegetables in a strangely sweet red sauce is not so good. I’ll return shortly with quick recaps of six more restaurants, some certainly better than others! If you could eat at any of the establishments I’ve mentioned so far, which would you choose? Quantum Leap was my FAVORITE brunch place that I discovered while in NYC. The whole-wheat vegan apple cinnamon pancakes with fresh fruit on top are to-die-for! Quantum Leap’s claim to fame is their specialty veggie burger varieties. I had one, which was delicious, but I’d say if you only have time for one meal at Quantum, stick with brunch! By the way, this place is heaven for vegetarians and vegans. Pros: So many options for those who avoid animal products, relaxed atmosphere, fantastic brunch, large menu of choices. The shake/smoothie counter at The Pump. Look at all that beautiful produce! How cool are those chairs? They have height adjusters just like gym weight machines! LOVE at first bite 😉 And supporting a restaurant that thinks like that is something I can get behind. I made many stops at The Pump to pick up blueberry protein muffins for a delicious, quick and healthy breakfast. Plus, this is a great place to get some of my favorite frozen yogurt I’ve ever eaten: Only 8. Most lunches and dinners are very customizable–you pick the protein and can get one of two different sizes depending on how hungry you are. Be sure to bring a business card if you have one and live/work in the City. They have a fishbowl drawing every week to bring you and 10 co-workers a free Pump lunch! Pros: Healthy, affordable yogurt, numerous nutritious options, delivery if that’s your thing, my favorite kind of ice (do you know what I mean when I say it’s almost “soft?” It’s almost between snow and ice cubes). Cons: Prices are somewhat high (the yogurt is pretty reasonable though), no restrooms in the locations I frequented. The veggie chili is my choice, pair it with some air-baked fries for a filling, somewhat balanced meal. If you go with the restaurant’s namesake, you can try classic beef, turkey, chicken, homemade veggie or savory soy. “Better dogs” are also options in beef, turkey or soy. If you’re involved in the “green” movement, you’ll enjoy Better Burger’s recycling program and their commitment to use cups, plates and bowls that last for less time in landfills compared to traditional restaurant dinnerware. Pros: Pretty affordable prices (see the combo deal), fountain drinks–free refills, free delivery in restaurant zones, tasty and healthier fast food, quick service, sustainability programs. Cons: Salads and Orange Plate Specials can get pricey, seating is a bit crowded at times, for being a self-proclaimed “guilt-free” restaurant, they should offer nutrition information for their menu items to back it up. Do you have any favorite places to dine in NYC or in your town? Hello everyone! I’m planning a couple more posts–one photo recap and one restaurant review post (unless you’d like any additional posts about my trip/job). So this is where I need your advice. This is your blog, as a reader, and I would love your opinion about the future of Health and the City. Please take a second to vote in the poll below and leave comments. Thank you and have a fabulous day! To celebrate safely arriving home one week ago, I decided to fill you in on the exploits that occurred on August 1. We’ll begin on the evening of July 31. Scene: My dorm room. 8 p.m. Orbitz calls my cell. Woman: Your connection flights have been pushed back, so it will take you from noon until 9 p.m. to get home tomorrow. Me: Are there any other flight options that would make the trip from LaGuardia to Moline quicker? Woman: Hmm…let me look. OK, if you fly out at 7:30 a.m. you’ll be home by 10:30 a.m.
Me: Wow, that’ll be an early start, but let’s do it. Woman: OK, you’re booked for the 7:30. Safe travels! So I finished packing up my last items and ordered a car to pick me up from my dorm at 5 a.m. I hit the hay around 11:30 p.m. to grab some shut-eye before the travel ahead. I woke up at 4:30, got myself and my stuff ready to go, and grabbed my car at the front door. All was going well until I stepped foot in the door near the United check-in area at the airport. A custodian said, “You can’t go in there.” I told him I had a flight to catch and kept walking–thinking it was just the wrong door. “Hey! Are you deaf? You can’t go in there!” he responded. So I turned around and waited at the curb with a few flight attendants. I noticed a group of travelers gathering and word was that a bomb scare had occurred. Or maybe someone had a gun? It was unclear what was going on, but it appeared we wouldn’t be boarding our planes anytime soon. Police, fire trucks and bomb squads cycled in and taxis were no longer allowed to drop off travelers on the airport grounds. Somehow, the crowds continued to grow (I heard of some who had cabs drop them as close as they could and they walked with their luggage the rest of the way). All the while, police and security kept pushing the group further and further from the building. I became anxious and worried about how I was going to get home–so it was time to call Dad for advice. He always knows what to do! (By the way, sorry for waking you at the crack of dawn Dad 😉 ) Strangely, nothing was on the news about the events at LaGuardia and he told me it would probably be best if I just stayed put. I had considered checking on the availability of flights from Newark and JFK, but those were probably full by now and I’d have to pay for the additional flight. During the wait, I read the People magazine my roommate had so kindly given me (Saved by the Bell reunion? Awesome!) and chatted with strangers in the same lousy situation. A woman carrying her Reem Acra wedding dress told us about how she was getting married on Friday. A music teacher and opera singer told me about her trip in NYC to celebrate her daughter’s high school graduation. A hedge fund guy shared about his life in Chicago and how he planned to return to Manhattan in three days for business–again. A cosmetologist, who looked more like a bar bouncer, talked about how he was headed to create a The Hangover II (did you see that hilarious movie?) for a pal’s bachelor party. And I sat with my four bags and tried to make the best out of the situation by striking up conversations with my comrades. If there's a bomb in there, take your time authorities! We were pushed out the doors, down the car exit ramp and into the parking lot. After a little more than three hours, the cars and trucks began streaming out of the terminal. The airport employees entered first and we were allowed to join them inside about 30 minutes later. I enjoyed watching the firefighters as they passed! Mass chaos ensued after we all streamed back into the terminal. It was shoulder-to-shoulder of frustrated travelers after learning that a man had “attempted to detonate” a fake bomb. The airline employees told us that those with early morning flights would be helped first, but rebooked flights were full out of LaGuardia for the next three days (Uh-oh). My new bouncer-style friend scooted to the front of the line, since we were both scheduled for the 7:30 a.m. to Chicago, and cleared the way. “Excuse me, please let her through. She’s with me!” We made it to about fifth in line, checked out bags (no fees!) and grabbed our tickets for our flight which had been delayed. For how long? No one knew yet. The next step was to line up for about an hour to get a shuttle bus to another terminal to fly out of there. We were worried that the plane may depart while we were waiting for the bus (plus we didn’t really understand why we needed to go to the other terminal anyways–other flights were departing from the terminal we started in). But we passed the time talking with a lawyer/former military serviceman and his wife and eventually made it to our gate to find our flight was about an hour to takeoff. Success! I helped my new friend charge his iPod touch on my computer and lent him my cell phone to call his pals since his was dead. In the meantime, I tried to call United to see if there would be another flight I could catch that day from Chicago to Moline since my original flight had taken off at 8:30 a.m. and it was currently noon. All flights for the rest of the day were full, so I called my parents and Dad came to my rescue again. Excuse the glasses and the not-so-hot look (my contacts didn't feel good at 5 a.m.), but I had to pay tribute to my new friend Cory. I couldn't have made it home Saturday without his help! Boarding! We actually took off more around 1 p.m. I was stoked to be off of the airport grounds! My Dad drove to pick me up and I made it home that night by about 6 p.m. I was SO thankful that I made it home the same day (despite the fact that the trip had taken longer than even the original nine hour trip plan). And I felt extremely blessed that there was no actual danger involved in the situation at Terminal C. The man with the bomb-like bag may have even been booked on my flight. Scary! I texted my Quad-City Times editor about the events of the day and told her I’d be happy to share my experience if they were planning on running a story about the bomb scare. Newspapers always enjoy adding a local angle, right? A couple minutes later, a reporter called to ask about my day. Turns out, he hadn’t even heard about the LaGuardia events until he spoke with me. I was quite surprised that it was publicized so little! (When I had to pick up my luggage from the Moline airport after driving home, the employees there said that it had been crazy that day, but they didn’t know a thing about the bomb situation). If you’re interested in reading the newspaper story, see here, especially for more details about the perpetrator and situation as a whole. The shower that I soaked in before I ate dinner at Noodles and Company with my Mom was the best shower I had taken in a LONG time. Something about a nice, warm clean-up in your own bathroom after a long day!